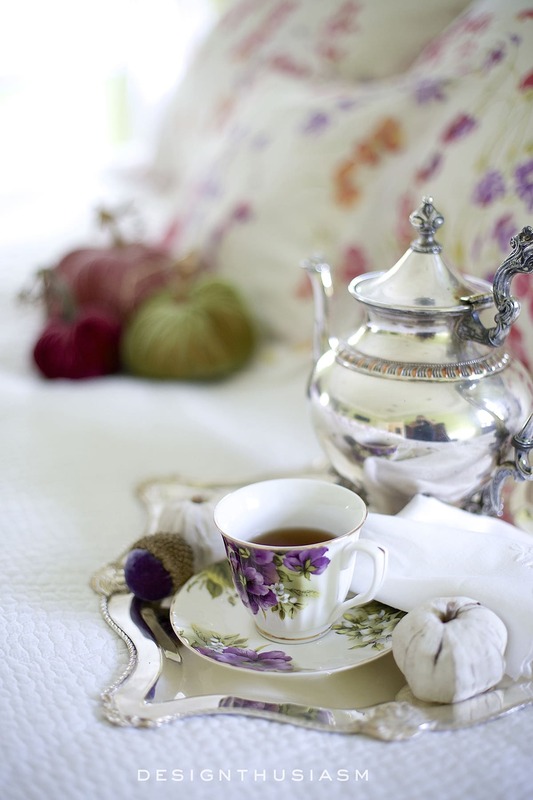 One of the things I most love about fall is the warm feeling it brings to the home. 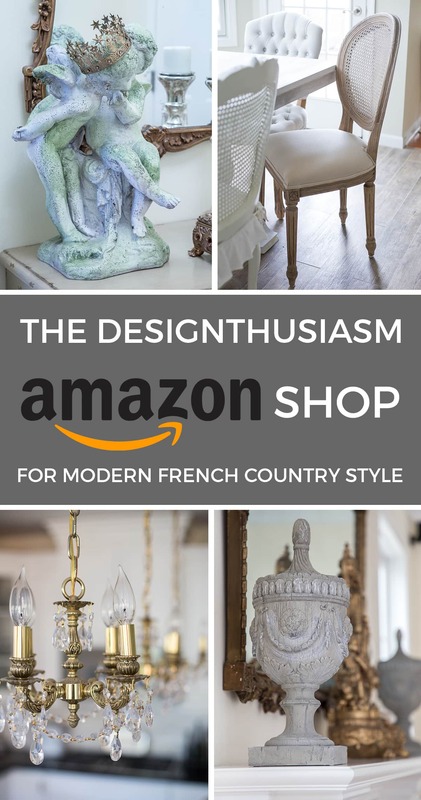 This cozy feeling can be delivered in several ways, from plush textured fabrics to traditional autumn imagery. 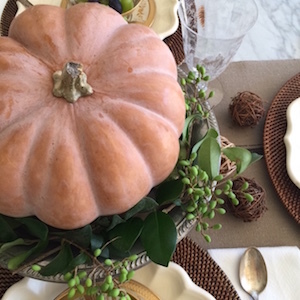 But the season also is known for its own unique color palette, and while I start out decorating in very neutral colors, as the season progresses I begin to add in richer tones. 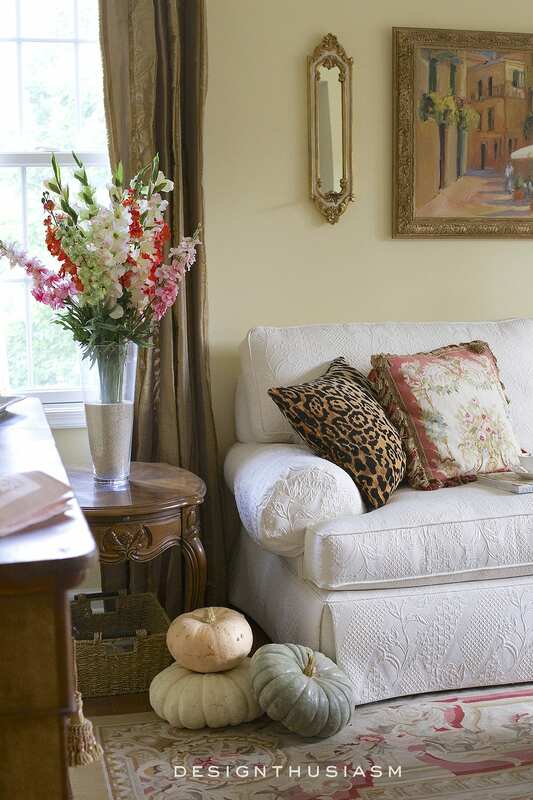 Here are 12 tips for adding fall color to the living room. 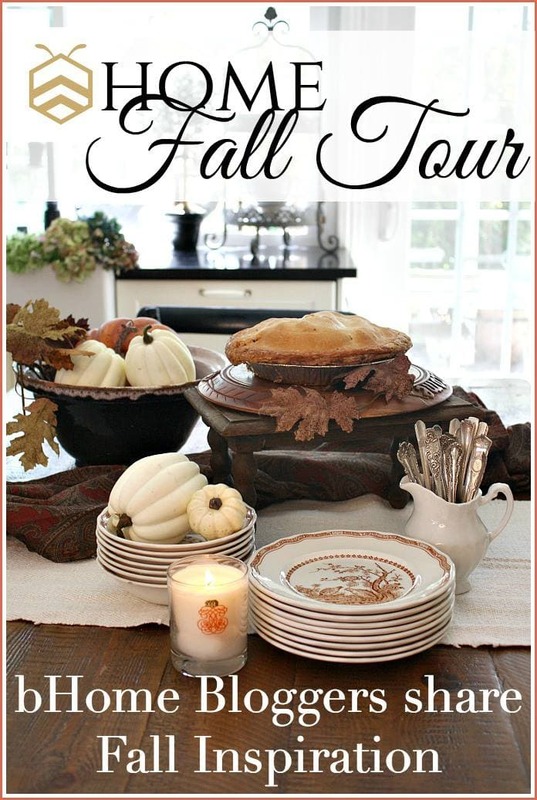 Today I’m joining with a group of bloggers to bring you the bHome Fall Tour. Please be sure to visit the other links at the bottom of the post. 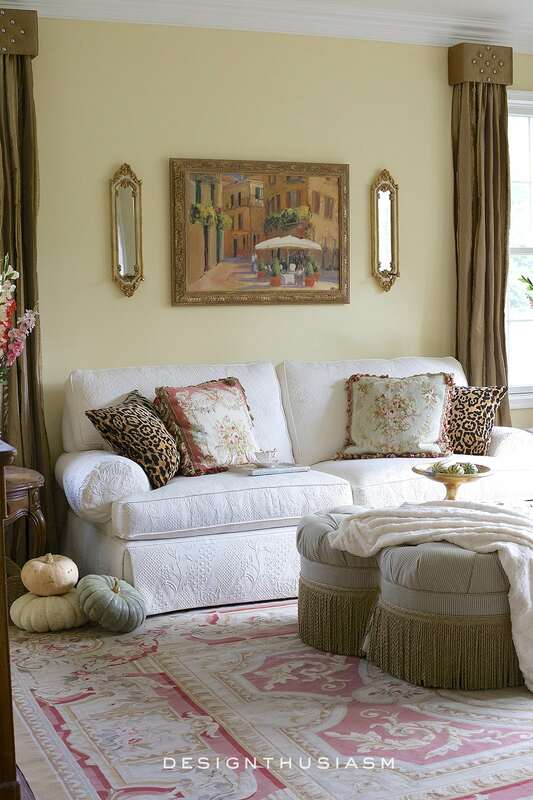 But first let’s look at 12 tips for adding fall color to the living room. 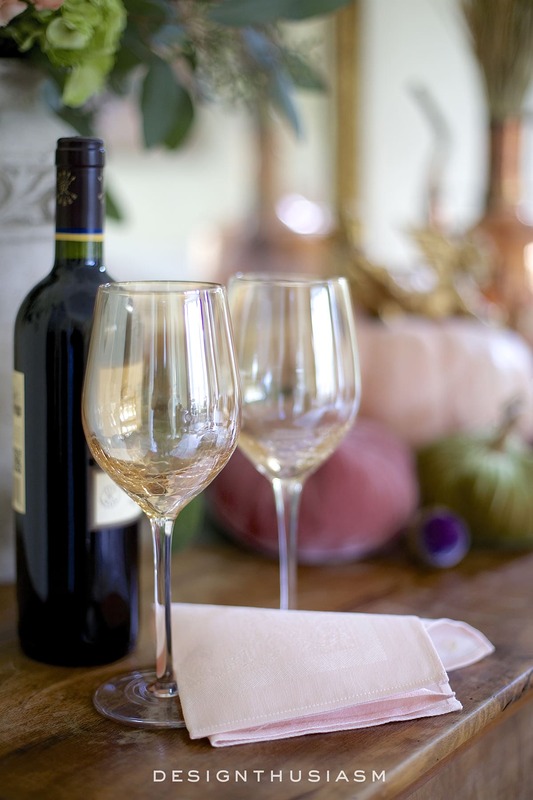 Red wine and golden goblets – the harvest season is a great time to sprinkle in vineyard imagery, from clusters of grapes to a vibrant bottle of wine. The gold crackle goblets are a lovely complement to the dark elixir. 2. Copper urns – I’ve been enjoying the versatility of copper for a year or so now. When paired with neutrals it adds a subtle gleam, but when mixed with deeper colors, its own red undertones can really be appreciated. 3. 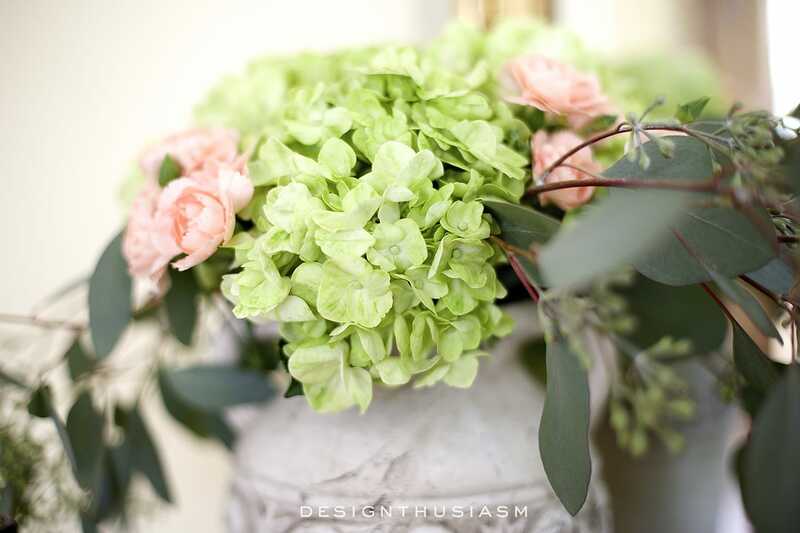 Fall floral – hydrangea and eucalyptus work beautifully here, and they both dry well once the arrangement fades. 4. 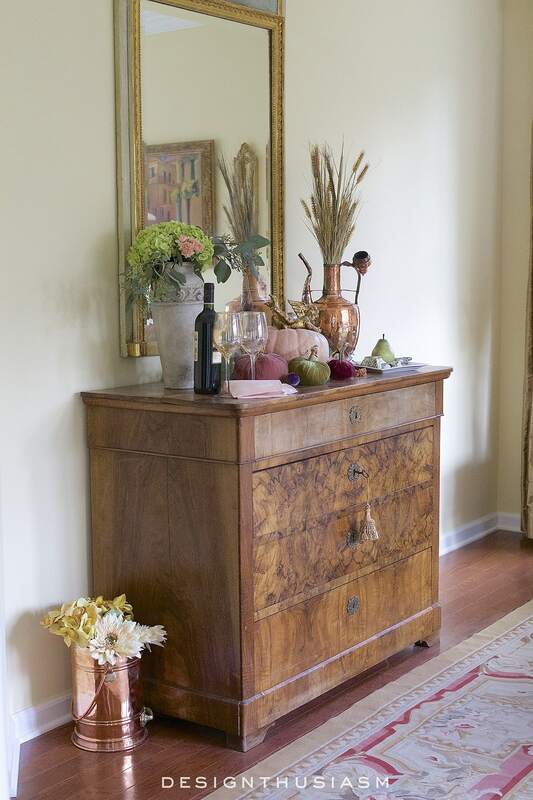 A vignette on the sideboard – I do fall vignettes throughout my home, and each one offers the opportunity for a new mix of objects. 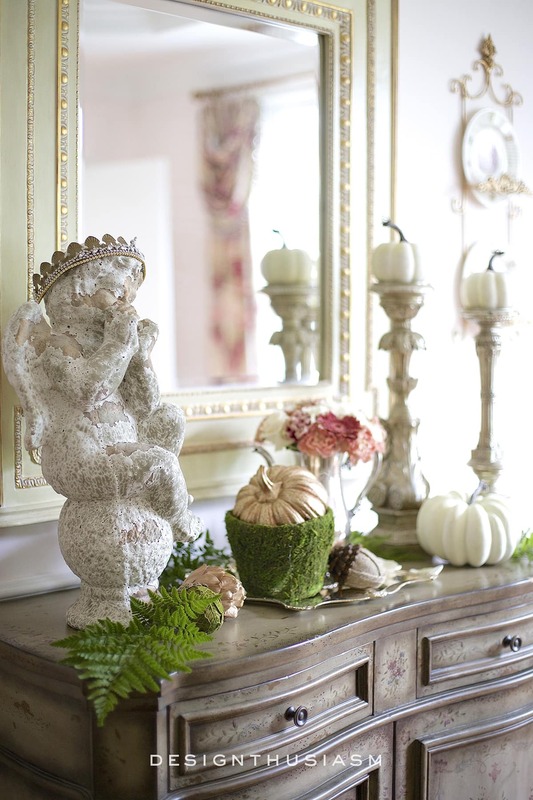 Here the presentation is topped with a gilded cherub, a way to personalize the more traditional items. 5. 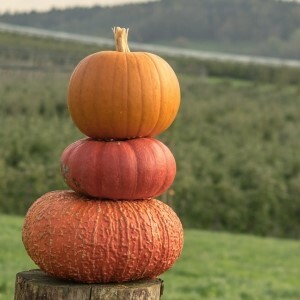 Assortment of colorful pumpkins – of course you can go with classic orange, but the more interesting pumpkins in both shape and color can be found at farm stands in pale warm colors. 6. Velvet pumpkins – you’ll be seeing a lot of these beauties, as I’m crushing on them big time. 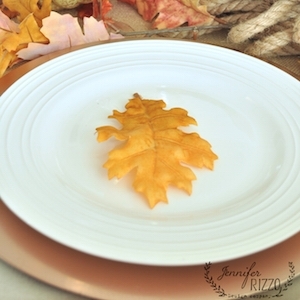 They come in all colors and sizes and can really define your fall decor. 7. 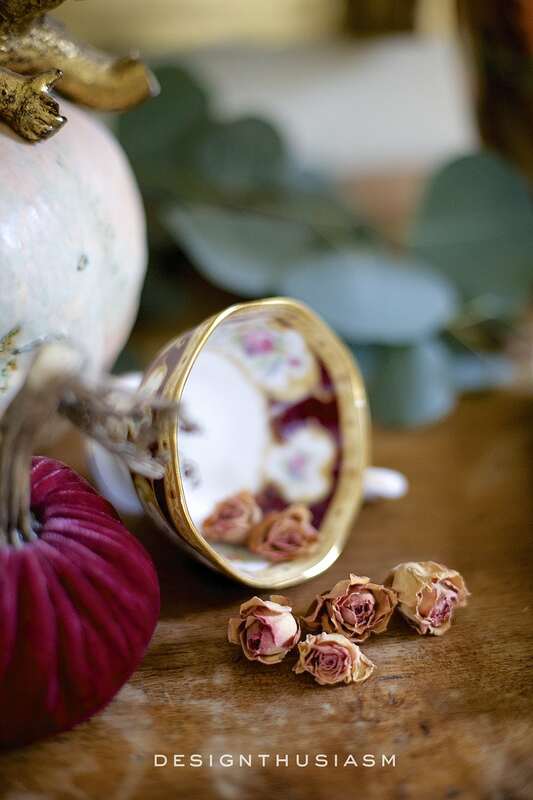 Dried mini roses – these flowers dry beautifully and add a lovely touch to any arrangement. Here I have them spilling from a teacup, but I really can’t get enough of these and use them all over. 8. 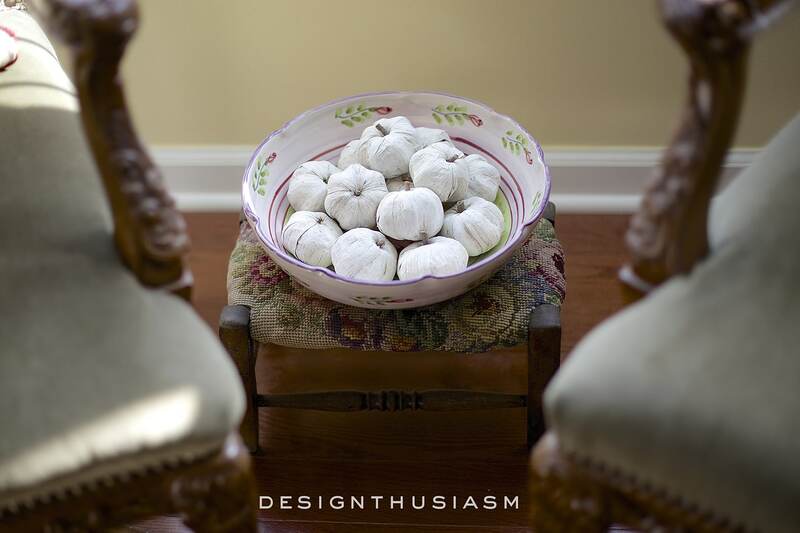 White craft pumpkins – I love adding these fun little bits to an oversized bowl and tucking them into obscure little corners. 9.Hay stalks in copper jug – another classic fall image is that of hay bales and stalks. The stalks look wonderful mixed with a copper vessel, which contrasts the dry texture nicely with its warm gleam. 10. 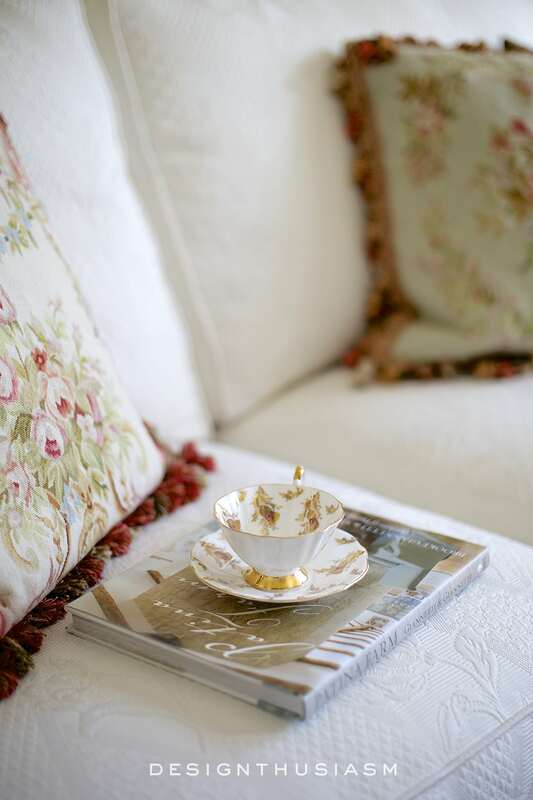 Cup of tea with a book – I’m always happy to display my teacups, but what better opportunity that relaxing with a book and a cup of tea? Pumpkin spice anyone? 11. 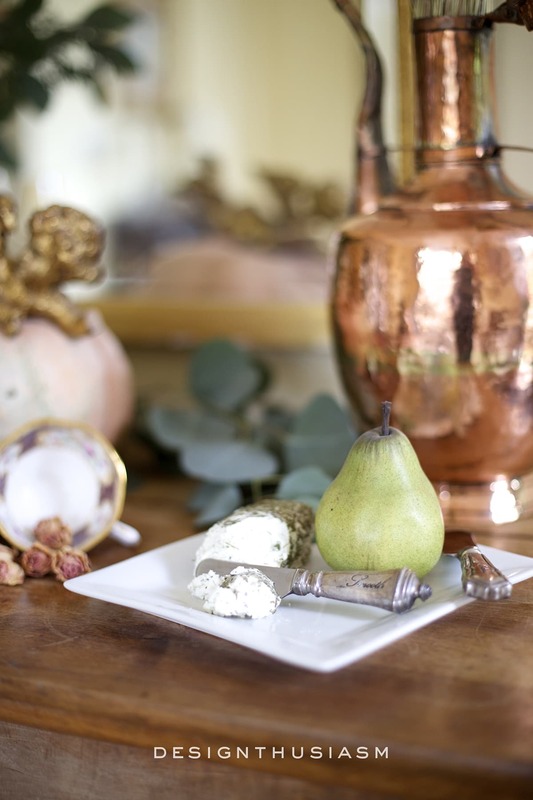 Pears and herbed goat cheese – to complete the fall vignette, some cheese and fruit is perfect for this setting. 12. Fur throw – a toasty faux fur throw is a wonderful item to drape over a chair, or to wrap yourself up in on a chilly evening. 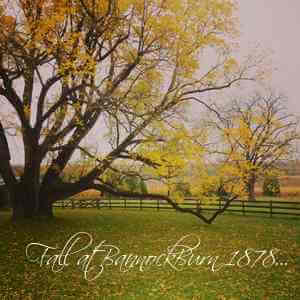 Such lovely photos filled with Fall inspiration! Just beautiful!! Thank so much, Cynthia! It’s such a delightful season to decorate for, isn’t it? 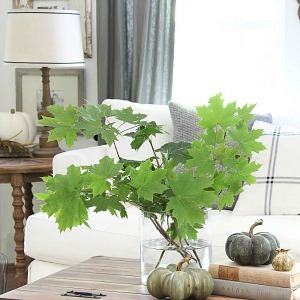 Great tips Lory which lend to great Fall decor in that most gorgeous room!!! Happy Fall! 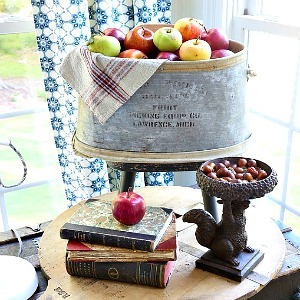 Those are all great ideas for adding fall touches in the home. I love all of these tips! Everything looks so beautiful. Lory, everything looks beautiful! Such wonderful Fall inspirations! 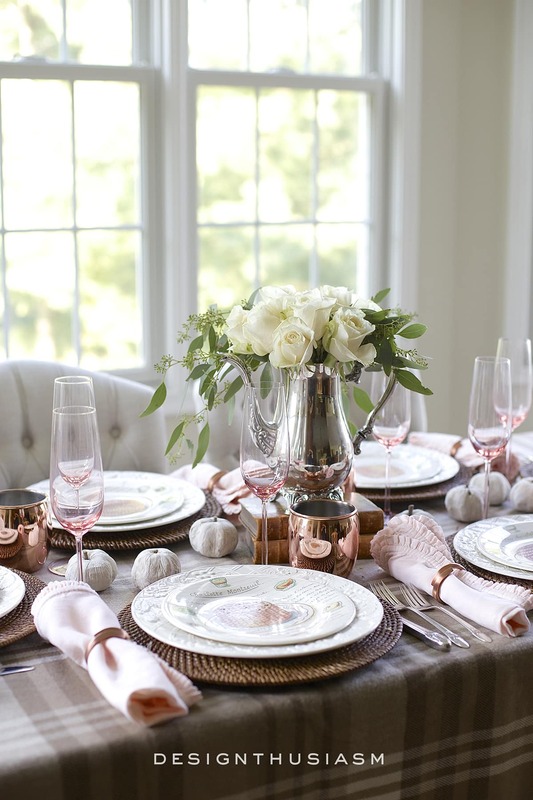 The loveliest and most romantic of fall touches! Thanks for all the great tips. I am gonna start right now to bring the fall into my home. Thanks for all your inspiration! 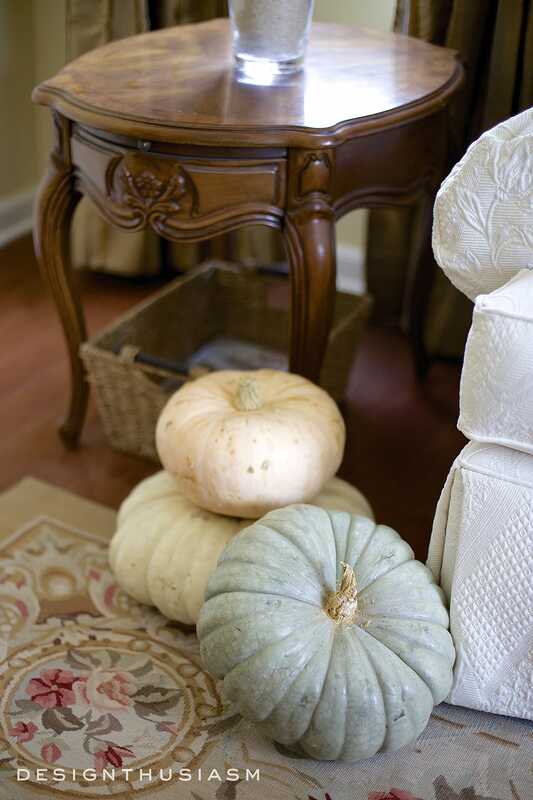 I love your fall decor and your space is gorgeous! So refreshing not to see everything in white! I love your couch! Where is it from? 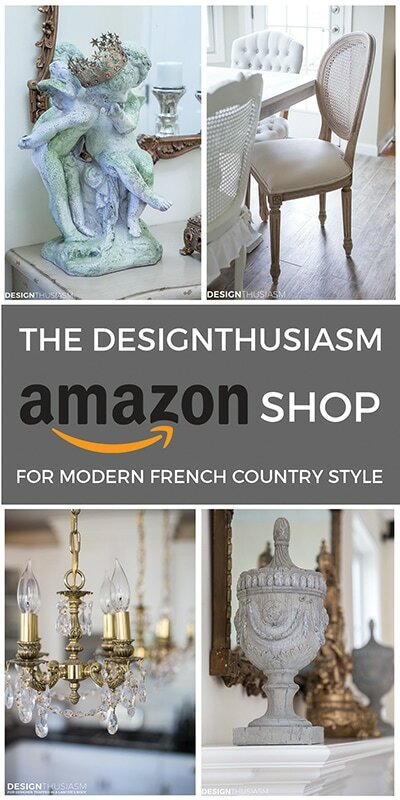 Love the color and texture of it and the warm wood tones in your furniture. I love the animal print pillows too. Going now to check out your Instagram feed! So peaceful and pretty. I always love the ‘non-orange’ pumpkins and the velvet ones too. Thanks, Laura! Yes, the velvet pumpkins seem to be my new crush this year! Can’t get enough of them and I love the range of colors they come in!! 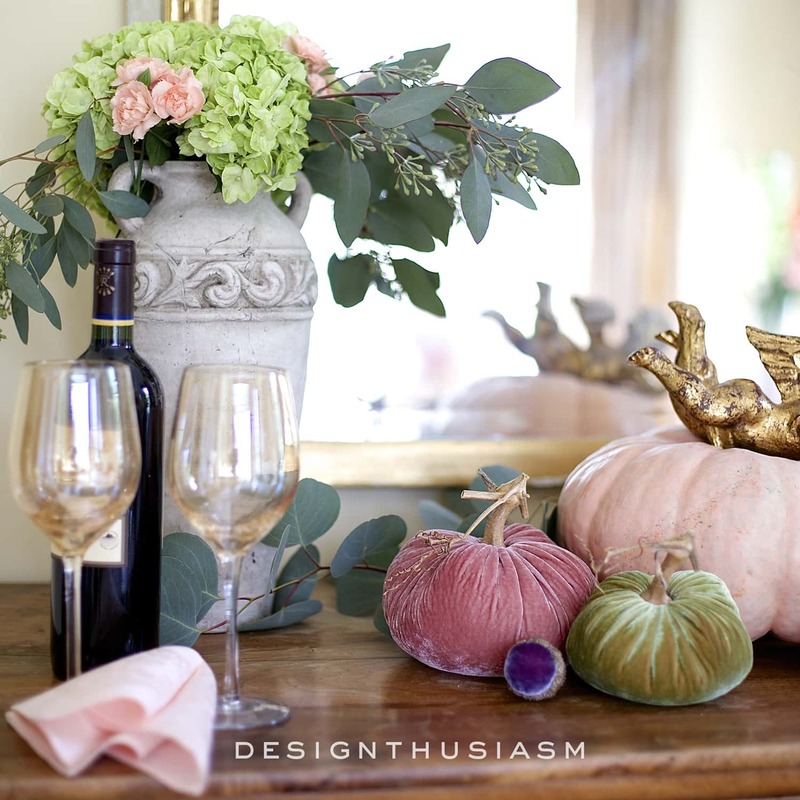 Oh, so elegant, and love the velvet pumpkins! 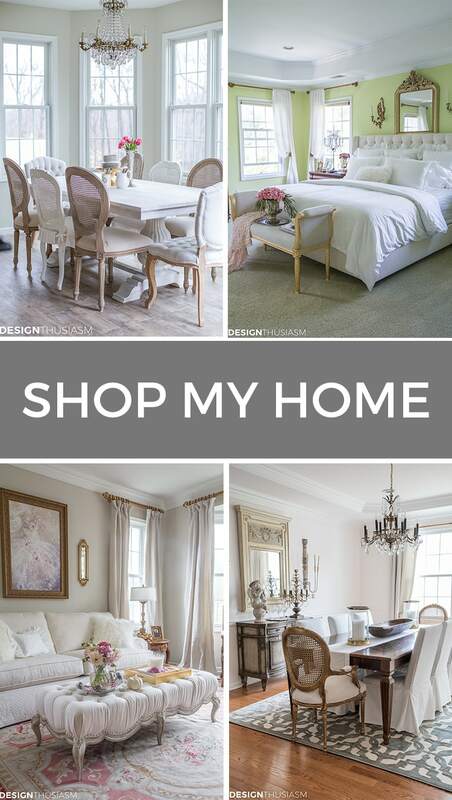 So lovely, your home is both elegant and welcoming! I am sure that coming to visit you is always a delight Lory. Your tips are fabulous. Thank you so much, Lidy! I’ve been a fan of your blog for a long time, so hearing this from you is especially meaningful… 🙂 Thanks so much for all of your work with this tour!! I’m delighted to be a part of it! I really loved all your tips. 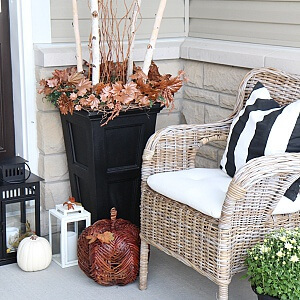 Your home looks so beautiful and I like how you selected fall decor that worked with your homes color palatte! So beautiful!! Thanks, Kristy! 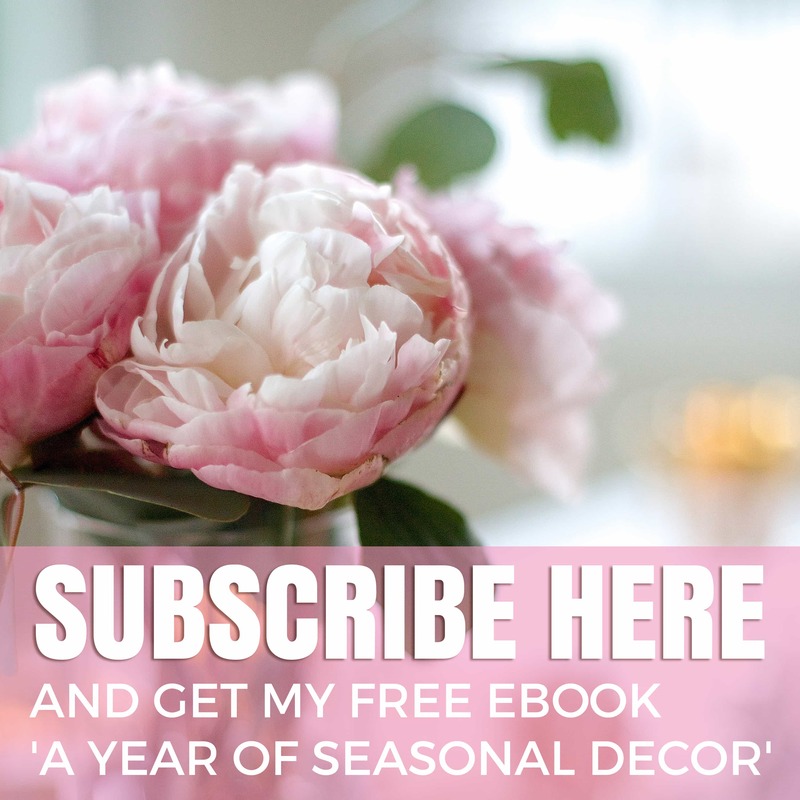 I’ve always enjoyed the challenge of working seasonal decor into a palette I enjoy… 🙂 I see you did the same! I love your elegant and sophisticated living room. 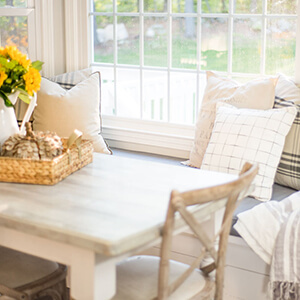 Soft fall touches that give your room warmth and coziness. Aw, thanks Janet! And thanks for visiting!! 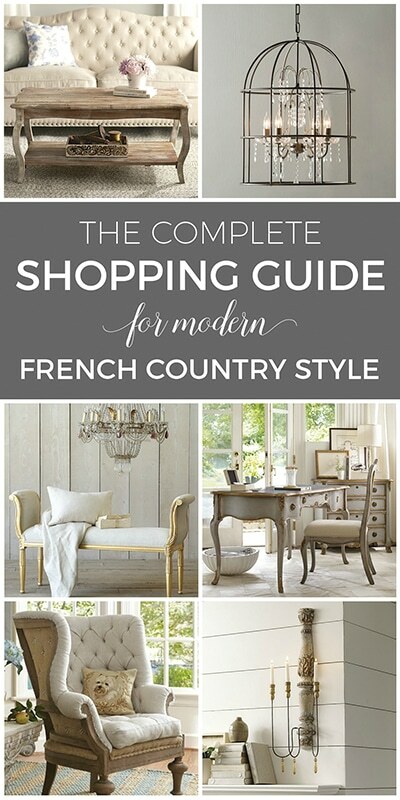 https://www.pinterest.com/pin/130111876714388847/ pinned. I would love to try these with some projects of my own. Thanks, Toni! Yes, I was planning to add the links into the post when I got a moment. Will see if I can find the info on the pillow and add it now. Thanks for visiting!! Absolutely gorgeous Lory! Your soft colors and fall are magic together! You have such an elegant home. Love the pink, cream, and green for fall…soft, but still warm. I just decorated today, using red, yellow, and orange, my favorite colors. In future, I am thinking of a softer palette. My upholstery is neutral, so I have flexibility. I pinned the paint product to my paint board (eventide username), but no idea how to get link. Sorry…tech newbie. Thanks, Tracy! Sounds like your color palette is very pretty, but if you just go softer, you’ll have your signature look but with a more gentle feel to it. And yes, neutral upholstery makes everything easier, so you can change your look by simply rotating accessories. I have pinned to one of my boards, not clever enough to link it! 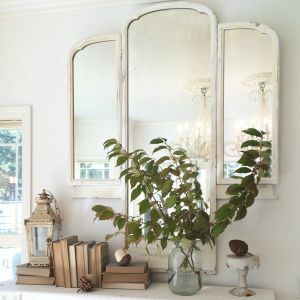 Also followed you on pinterest, I am subscribed too, but love your inspirational table scapes so I wont miss a thing now! Thank you for the posts and your great detailing! 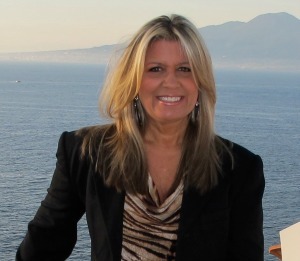 Aw, thanks so much, Heidi, for your kind words and for following!! I did it! I pinned in on Pintrest on DIY. 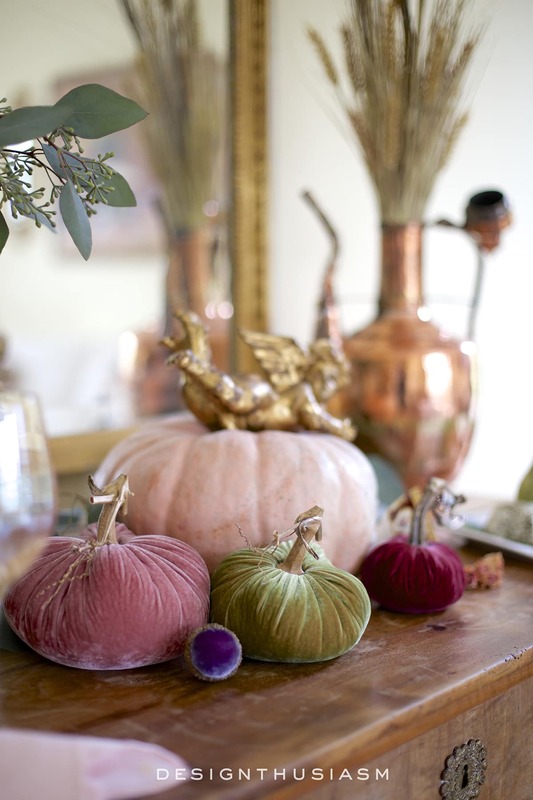 Love the fall ideas and especially love, love the velvet pumpkins! Thanks for sharing. Thanks and good luck with your entry!! 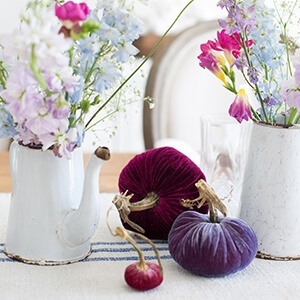 Such pretty inspiration and I am a big fan of velvet pumpkins. My are on the softer side as all my fall touches. Thanks so much, Cindy! And thanks for visiting!! 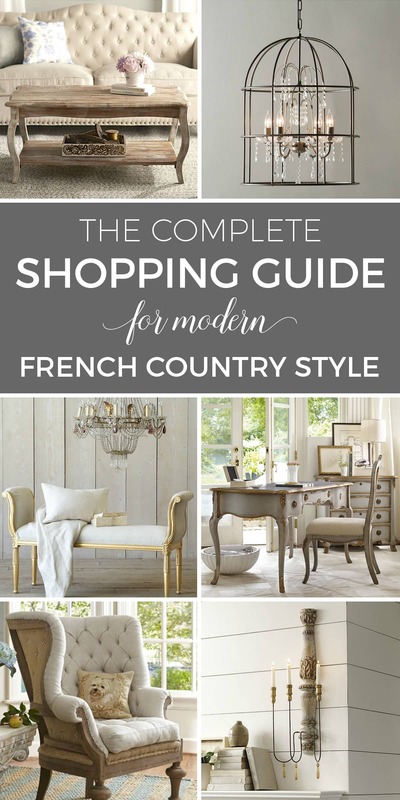 pinned to my Pinterest PIN TO WIN board. 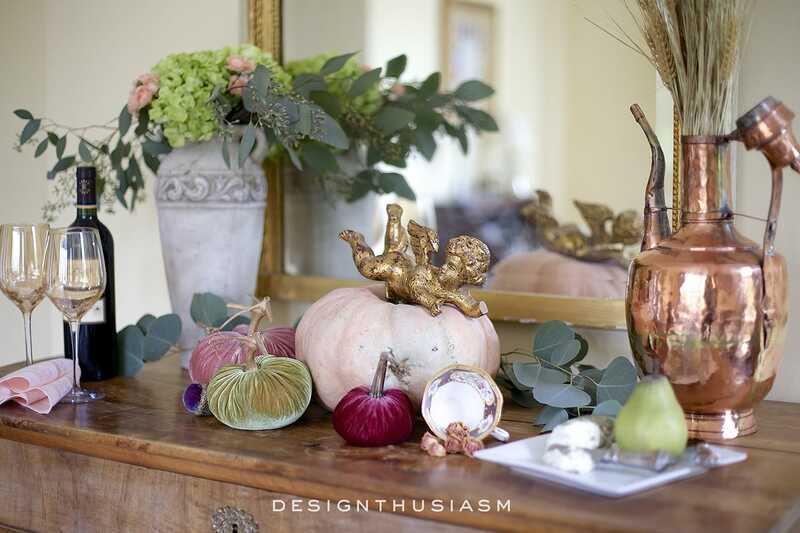 LOVE all the 12 tips for adding fall color; especially the velvet pumpkins. Thanks so much!! Yes, more velvet pumpkins coming soon!! 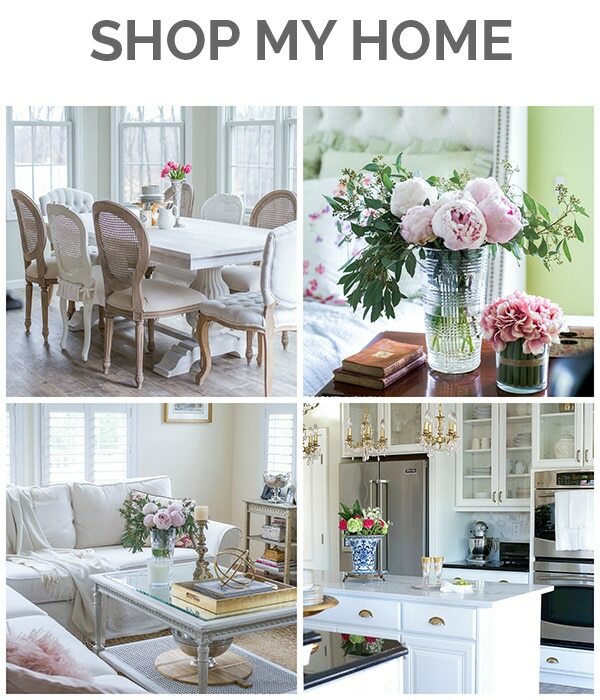 What a lovely home; thanks for sharing. ‘Have pinned the paint saver! Lory – absolutely stunning. My pinning finger is worn out going thru your post. I wanted to save & savior every image. Love having you with us on bHome & the tour! Thanks so much, Kelly! I’m delighted to be on the tour as well! And thanks for the pins… 🙂 I’ve been pinning away too from all of the posts. What a pleasure to have some new things to pin! Great tips and beautiful images Lory. Pinning now!! Love your posts. I pinned The Paint Saint post! Absolutely beautiful room!!! I need a boost for fall, and I think your ideas have given me just the help that I need. I have nowhere to “pin” anything, but I would love to be entered into the drawing. Thanks you so much for your kind words and for stopping by!! 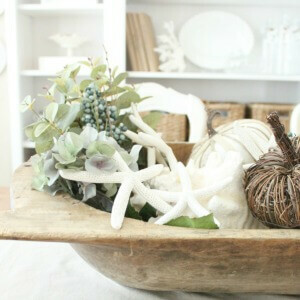 Lory, your home is so elegant and filled with so many lovely touches for fall. I think those pumpkins on the floor next to your sofa looks amazing! I’m loving the white slip covered sofa in the living room picture. 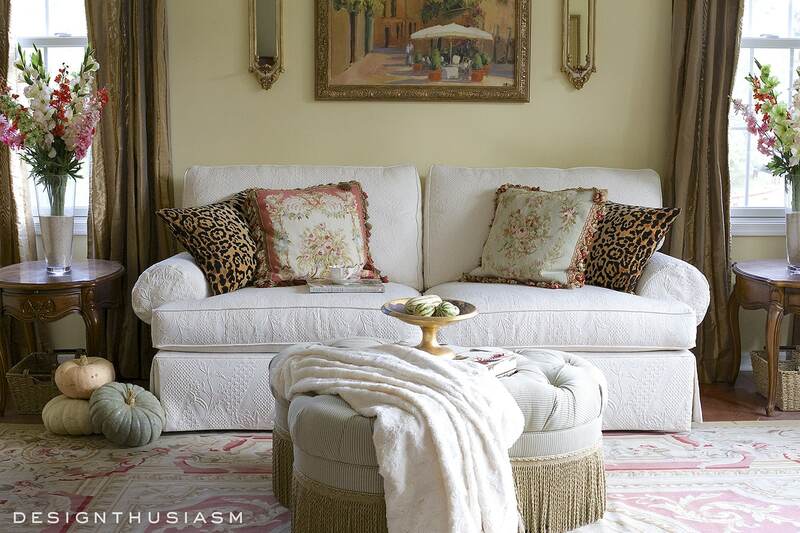 Wondering the brand of sofa and if you all had it professionally upholstered or are those slip covers. I want it! I love it! I need it! Thanks, Jan! It’s from Ethan Allen and it’s upholstered, not slip covered.